So you finally got the drum set of your dreams, set it up and began to jam. The only problem is the complaints from other people in your house—and the neighbors—who claim your drumming is just too LOUD. Now you have two options. You can just ignore them and risk eviction, nasty remarks and some potential visits from the police; or you can soundproof your room—a method that will make everyone happy and still allow you to drum away. For the sake of peace and harmony, let’s assume you choose option number two—soundproofing. The only remaining question is “how to get started,” and that is where we come in. Below we will provide several tips on how to soundproof your room for drums, beginning with a definition and disclaimer on soundproofing. Soundproofing is a technique designed to keep outside noises out of your drum room or studio, so as not to disturb or distort your music; and to prevent inside noises from escaping your studio, so as not to disturb your household members or the neighbors. There are several techniques you can employ to close off your studio from outside noise and dampen the sounds that are coming from within. These techniques are very effective at GREATLY lessening or muffling these sounds, but the truth is that complete “soundproofing” is kind of a myth—it doesn’t exist. Regardless of the methods you employ, it is virtually impossible to block out all noise, but the techniques outlined below will definitely get you on better terms with the neighbors. Mesh drum heads are a low-cost way to lessen the sound of your drum beats. These easy-on, easy-off mesh heads feature a mesh surface that is typically made from a double or single ply fabric designed to muffle the noise when you drum. The tightness of the mesh on these heads does give off a rebound, but that rebound, which causes the noise, is much less than you would get with a regular drum head. Mute pads, also known as “sound off pads,” are rubber pads that you place on your drum heads and rubber sleeves that seat on your cymbals and hi-hat. They reduce about 75% of the noise from the drums, but keep in mind that the rebound from these pads is not the most desirable, and certainly not as good as that of the mesh pads. In terms of muting the drum, however, they are very effective, producing mostly dead thumping sounds. Again, they are very handy when practicing your drums late at night. Finally, with low volume cymbals—metal cymbals filled with holes—you can eliminate most of the vibration that results in the loud noises they normally create. The sound quality of low volume cymbals varies from one model to the next, but many manufacturers claim that their low volume cymbals can cut the noise of these instruments by nearly 80 percent. 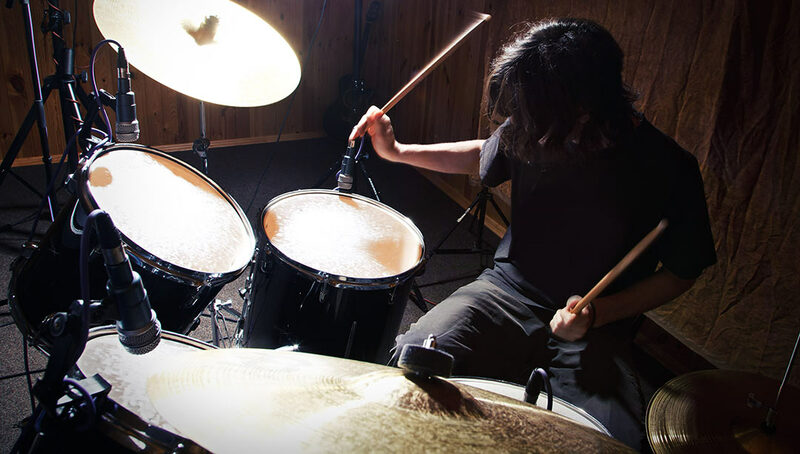 There are many different room treatments that can help lessen the sound escaping your drum room. Here we will cover just a few of these treatments. Adding mass to the walls, or essentially thickening the walls, can help reduce the amount of noise that escapes to the outside environment. Simply put, thicker walls translate to less noise. There are many ways you can do this, including adding sound panels around the walls of your room. These panels can be purchased at many home improvement stores, lumber yards and even some music outlets, including a popular product known as Sheetblock. Damping is a unique soundproofing technique that can help lessen the energy from sound waves produced by drums. Damping does that by converting the kinetic energy of these sound waves into heat. Now I know this sounds very technical, but the process of dampening is actually fairly easy. There are many dampening products on the market today, most of which come in the form of soundproofing glue. This glue is ideal for creating a makeshift barrier around the walls of your drum room, a process that will also add a lot of mass. Most people use dampening glue to fasten two pieces of sheetrock or paneling together. Once they have done this, they simply fasten these two-piece boards or panels around the walls, floors and ceilings of the room, creating a near-soundproof environment within. Windows can also be dampened using soundproof or sound dampening curtains. These products are widely available and represent a low cost option for reducing unwanted noise. Whenever two structures are near enough to each other to touch, the vibration created from these structures can cause a lot of noise and unwanted feedback. To remedy this problem, you will need to separate—or decouple—these structures to reduce the unwanted noise. Decoupling can take place on the walls, floors, ceilings and wherever else it is needed, usually by placing some form of pliable rubber between the two contact points that are creating noise. Every room has a door, and the door is one of the biggest culprits for allowing noise in and out of the room, even when closed. To decouple your door, you will want to buy some type of removable rubber strip or seal that can be placed between the door and its frame—two contact points that together can cause noise to be amplified. Like the door, the windows in your drum room or studio have frames, and when the window and the frame are touching they can amplify noise to the outside. These can be decoupled in the same way you did your doors, with removable rubber seals that are placed between the window and the window frame. There can be no doubt that the walls and ceiling of your drum room are the primary source of noise, thanks largely to the large surface area. However, decoupling your walls and ceiling is actually a pretty big project, and if you are merely renting your place we highly doubt you would get approval from your landlord. Nevertheless, to decouple your walls and your ceiling you will need to put a barrier between the sheetrock and the outer frame of the room. This involves taking all of the sheetrock off the walls and ceiling, placing a rubber barrier up, and replacing the sheetrock. We realize this is a major undertaking, so you may want to elect to just dampen the walls and ceiling rather than decouple them. Every room has little cracks or holes, some more than others. This includes your drum room or studio. When taken together, these cracks and holes can allow outside noise to enter your studio and inside noise to escape to the neighbors. To ensure this eventuality does not befall you, you will need to search out these discrepancies in your drum room and fill them. One of the largest “holes” in your drum room is bound to be the space underneath your door. This can be filled using a temporary rubber door block, the same type used by people in colder climates to keep the cold temperatures from entering their room. Finally, other holes, such as those around windows, electrical outlets, and inside doors can be filled using foam gaskets, which can be purchased at any hardware or home improvement store. Last but not least, let us talk a little about floor coverings. Keep in mind that your drum set sits on the floor of your studio. As such, it is bound to give off vibrations that can escape to the outside. And while not all sound can be eliminated from the floor, there is something you can do. Most floors consist of concrete, followed by a sub-floor, followed by some type of floor covering. Naturally, the best way to soundproof the floor would be tearing it up and rebuilding it, much like you did when you decoupled your walls. However, this is way too big of an undertaking. If your current flooring consists of wood, tile or linoleum, it’s important to understand that these types of flooring options are terrible from an acoustic standpoint. Instead, you should install carpet in your drum room, preferably a low shag style carpet, much like you would see in a movie theater. This type of flooring will not only reduce the level of noise that escapes the room, it will also improve the room acoustically, making your drums sound better than you ever dreamed possible.